T-shirts, coffee mugs, bags and purses and more, the video game world has been slowly bleeding into the real world as more and more companies start to realise that there is a merchandising market out there for people who like video games. 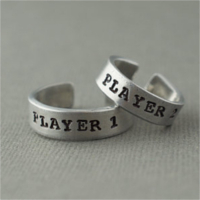 Jewellery is one way of expressing your dedication to a certain games franchise or console without expressly shoving it in someone else’s face. Jewellery can be as subtle or as gaudy as you choose to make it, so it is perfect. Jewellery is not just for the ladies. Take a look at three awesome products for both guys and girls who game. It’s dangerous out there, take these! Whether he plays the Xbox One, PS4, the WiiU or he fancies himself a PC gamer, gamepad cufflinks are a fantastic way of showing off your geeky side with style. There is a range of different options available to suit each console and you can even get more traditional controller cufflinks, such as the PS1 controller and the NES controller. 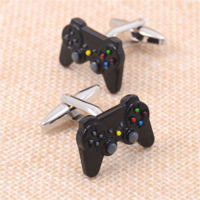 Non-gamers will look and see an oddly styled set of cufflinks, but gamers will definitely know and recognise the unique style of these accessories. Check out these cufflinks on Etsy. The Harry Potter franchise stretches over seven books, eight blockbuster films, dozens of games and countless other merchandising products. It is one of the best things to have come out of the creative market in the UK in recent years and still holds a special place in the heart of many a geek. 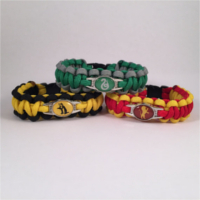 Whether he prefers the Lion over the Snake or even if he has a special affinity for the Honey Badger, you can easily find a woven bracelet in his choice of Hogwarts House. Bracelets themselves are often considered a bit of a ‘girly’ item, but woven bracelets are popular with both genders. They can be subtle or loud depending on the colour scheme you choose and you don’t have to take them off if you want to go to sleep or to go swimming, for example. They are often resilient and aren’t quite as ‘gaudy’ as a metal or plastic bracelet. Check out these bracelets on Etsy. One should never use the Master Sword as a letter opener, but a cute scale replica should be fine. 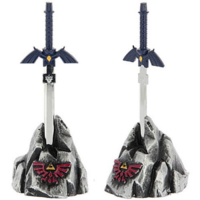 Miniature weapons from video games and TV series are gaining popularity as both keychains and letter openers, often because they are nicely detailed and they are just adorable. You just know he’s going to absolutely love this! Check out it out on Amazon. 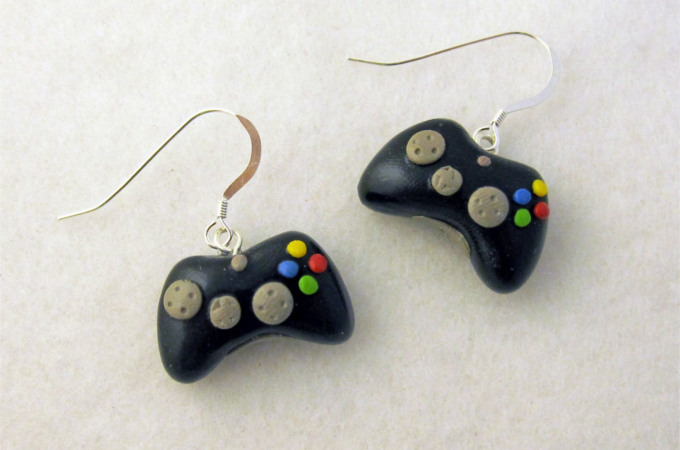 Like the gamepad cufflinks, controller earrings are a great and subtle way of showing her allegiance to a particular console or even era of gaming, if she prefers some of the more classic controller designs. 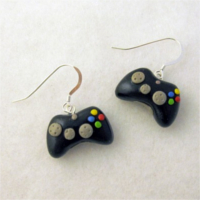 Sellers offer replica controllers as drop earrings or as studs depending on the design and many earrings are also handmade from polymer clay, making each earring look as genuine as possible. It’ll be like you’ve shrunken down your own controller just to hang on your ear! Check these out on Etsy. The deathly hallows represent three of the most important objects in the Harry Potter universe. The symbol for the deathly hallows has been recreated on handbags, earrings, t-shirts, bracelets, necklaces and more. It is a widely recognised symbol from the Potterverse and almost instantly points out one ‘Potterhead’ to another if it is spotted. 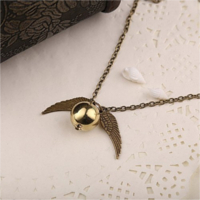 Likewise, the Golden Snitch; first seen when Harry starts Quidditch practice as ‘The Youngest Seeker in a Century’ has also been used on different jewellery pieces, making it an ideal gift for any female fan. See this necklace on Amazon. The Golden triangle that features in most – if not all – of the Legend of Zelda games is iconic. 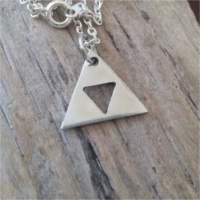 Die-hard fans will always have some form of triforce in their collection and for girls who love Link, a charm bracelet is a great way of showing off her geekiness. As time goes by she can even add to the charm bracelet, using charm heart containers, a scale model bomb bag, perhaps even a rupee or two. Check this out on Etsy. Some people like big precious gems, for others, a simple band with a quote from their favourite game is more than enough. Both rings and symbolism feature heavy in a number of different video game franchises so if you’ve got a game franchise that you both share – whether it is Super Mario, Pokemon, Assassins Creed or Overwatch, you can be sure to find the best ring to suit the both of you.